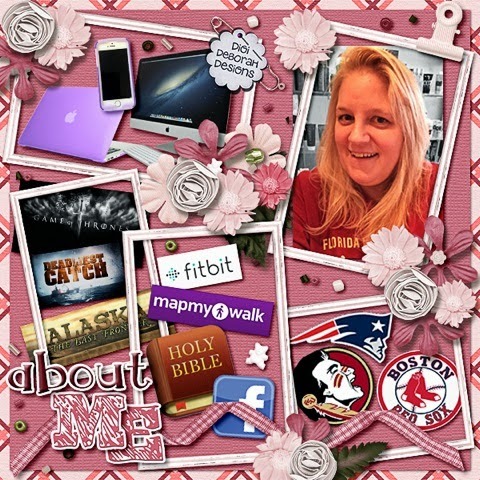 MyMemories Blog: Meet Today's Daily Designer....Digi Deborah Designs! Meet Today's Daily Designer....Digi Deborah Designs! I’m a proud wife to a retired Navy Seabee who served in not only Desert Storm, but also Operation Iraqi Freedom. We have three grown daughters. One is married, one in graduate school and one working towards her Bachelor’s degree. I also have 2 adorable boxers called Axel and Bear AKA Schmickles and Bibbles. They are the most wonderful therapy after a long day teaching middle school Technology. I’ve been a teacher for 13 years and it’s been an amazing experience. I especially love that I get paid to teach programs like Photoshop and Illustrator. My story now is that I’ve been a member of Weight Watchers Online since February 7 and since than, I’ve lost a total of 32 pounds. Last month I began a walking program after I seemed to plateau a little bit and just last Saturday I completed my very first 5K in Personal Record time. I walked most of the way and it was kind of tough, but I signed up to do three more in the Summer series!! Since I’m not working during the summer, I’m planning on joining the local Triathlon Training Center to keep myself focused on my fitness goals. I’m a grateful daughter of God and I love to sing praise and worship music while I walk. I was saved less than three years ago and learning to know God and Jesus in this way has given me tremendous peace and joy in my life. I live to serve Him and all the good things I do in my life are because of God’s mercy and grace. Thank you to all my wonderful fans who humble me when you buy my designs for your scrapping stash. I am blessed that a little bit of me with be with a little bit of you forever!!! Make sure you visit Digi Deborah Designs Shop today and enjoy 50% OFF! I love your story and PTL on your being saved 3 years ago!!! Please,Thank your husband for serving our country from our family. What an impressive career,that's so amazing! !